Have you shifted your Facebook marketing strategy in recent weeks? Since Mark Zuckerberg announced the sweeping change to the news feed algorithm back on January 11th, there’s been a wide variety of responses out there. I’ve seen everything from recommendations to stop publishing content on Facebook altogether, to only using your personal profile and groups. Thing is, there is an incredible opportunity right now on Facebook. And, the whole Facebook family of apps for that matter. Facebook, Instagram, Messenger and WhatsApp. 1. VIDEO. Publish a mix of videos you create professionally + your Facebook Live broadcasts. Live gets six times the engagement than recorded on Facebook. Consider going Live and/or uploading recorded videos on the same day and time each week so you have episodic content as a potential show on the Watch platform. Watch is currently in private beta in the US only. US business Page owners – apply to get your Show on Watch here. 3. GROUPS. Proactively build and serve your communities. Facebook has been putting huge emphasis on groups for the past ten months or so with a couple of major live Communities Summits and the release of a slew of new features for Admins and members. The latest? Check out the brand new Watch Party where admins or moderators of a Facebook group can select any public video and host a ‘party’ for group members to watch simultaneously and discuss. Lots of great potential here for businesses, training, community and more. 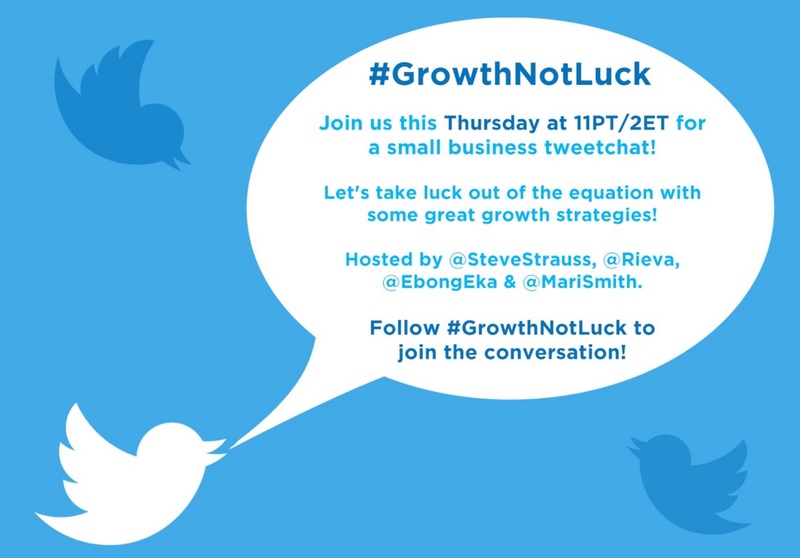 Join the #GrowthNotLuck live tweetchat! For this tweetchat, I’m delighted to team up with my fellow small business influencers, @SteveStrauss @Rieva and @EbongEka. I’m also thrilled to be a new columnist for Bank of America’s Small Business Community, alongside Steve, Rieva and Ebong. I’ll be writing a bi-monthly column for BofA SMBs on Facebook and social media marketing success tips! I’ll keep you posted when the column publishes. The dust has settled a bit after Facebook’s News Feed change announcement, and it’s time to take a look at how we can work with the changes. After all, Facebook remains an excellent way to grow your business and engage with customers. Targeted video ads, Facebook Live and a more detailed approach are all part of a successful plan. The goal of the recent news feed changes is to help us have more “meaningful social interactions”. One of the best ways to achieve this is in Facebook Groups. After all, people love to belong and groups give us the chance to connect with like-minded individuals on a topic that interests us. There are many reasons why ecommerce brands should be using videos in their marketing. For example, product demonstrations increase conversion rates, behind the scenes stories help to connect with potential buyers, and social media networks give video content priority. This post has great tips on creating better videos and several good examples for inspiration. That’s a wrap for this week’s issue of The Social Scoop. Keep on enjoying the week, and we’ll talk again very soon!